So, for my birthday I decided that I wanted faux locs. I also decided that I wanted to do grey locs. Anything that I do I like to do different with a bit of edge. I found out that my friend Andrea does locks, she actually does her own locks and they look amazing so she was the perfect choice! 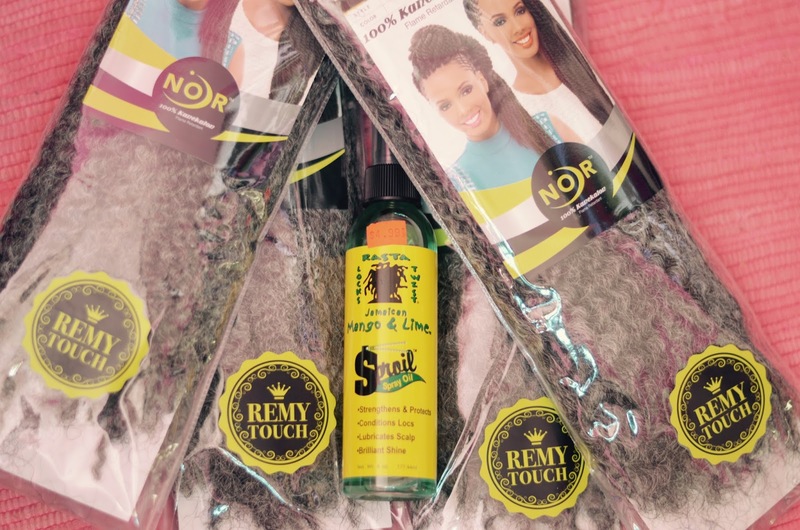 The hair used is Marley hair or afro twist hair by Noir, number 51. The hair looks and feels amazing. It makes me want to actually lock my hair but I am definitely not up for that commitment. The hair is $4.99 a pack and only sold at some beauty supply stores. For my locs to lubricate my scalp and keep the locks looking fresh & shiny I use Jamaican Mango & Lime Sproil spray oil for Rasta lock twist. I used this spray before I got faux looks because my dad has actual dreadlocks and he uses it. It gives your scalp a cool, relaxing and refreshed feeling so I used it before I would get my perms. Now that I have locks it is still perfect for my hair. This bottle of spray is $4.99 as well. There are also many other products in this brand, including hair grease.